Submitted by Jeff Buster on Thu, 05/07/2009 - 12:07. This is a 5 1/2 minute video. Don't look at it full screen the quality is poor because it is a 10 frame per second video of a computer screen - causing wicked flicker. You can see the web links which the computer screen references by going to them yourself. Here they are: WCPN At Noon (go to May 6, 2009), Brewed Fresh Daily April 29 Toni Chanakas, Dr. Richard Lightbody, Google images baloney sandwich from www.southernangel.com/food/bologna.jpg, other Bernoulli Google images, Wikipedia definition of charlatan, New York Times blog on Dr. Rashidi and water towers, CSU homepage of Dr. Rashidi. Have FUN! Submitted by None on Thu, 05/07/2009 - 12:30. This is a good example of a brain exposed too much fat and nitrates. Submitted by yyyyy on Fri, 05/08/2009 - 01:15. ... I don't think that commenting on the relationship between his diet and his reasoning ability is considered to be logical thinking. I must say, however, that I generally have agreed with Jeff and his commentairy on putting wind turbines on land, rather than in the lake. However, I guess Dr. Rashidi must not be putting up the "Lifeflight" "News Channel 5 'copter" catching monster wind turbines that Jeff must want to see in the center of the city by Cleveland State. So Jeff, just what sort of wind turbines should we be putting up in the centers of cities, and if not on water towers, just where should we be putting them? Please offer us some better creative ideas than those "we" have been spending our tax monies on. SPENDING TAXES ON A BAD IDEA HELPS US MOVE AHEAD? Submitted by Jeff Buster on Fri, 05/08/2009 - 15:03. CHIMERA - are you suggesting that until you hear an idea you like better than Doctor Rashidi's for urban wind generation - that the lack of alternatives makes it wise to spend money on the Doctor? This is beginning to sound like Miller's Crucible - go with the witchcraft! Why don't you ask Doctor for the wind tunnel tests that back up his H2O tank Bernoulli brainstorm and post them here on Realneo and put some pie in my face! Submitted by Jeff Buster on Wed, 05/20/2009 - 15:39. On Brewed Fresh Daily Toni Chanakas has met Mark L Cironi, president of Green Energy Technologies. 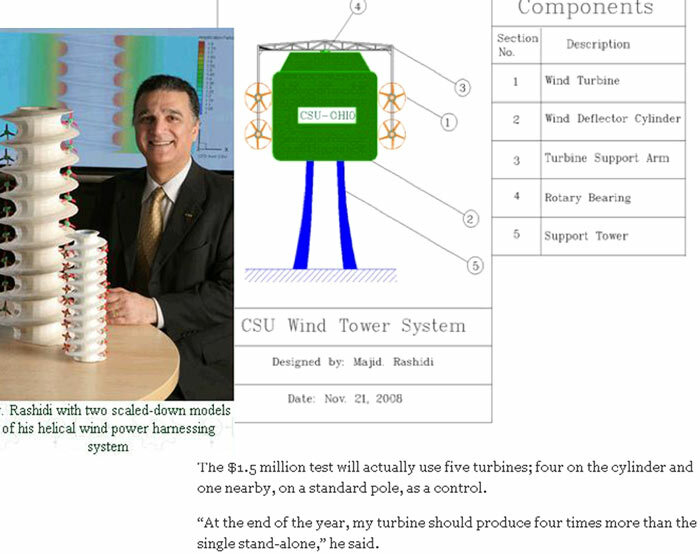 Mr. Cironi and CSU's Dr. Rashidi had a bit of a falling out over the "wind spire" so now it's the "wind cube". Problem with both Mr's and Dr's designs is that they are not cost effective and they will not benefit from the Bernoulli principle. Mr. Cironi always has a web site with lots of buzz. But Mr. Bernouli requires laminar air flow. Both Mr and Dr designs have extremely turbulent air flow. These commercial ducted wind turbine models from Japan and China probably have a little less turbulence than the "wind cube". Nothing is new about ducted wind turbine generators as you can see from this link. But it always seems to cost more to build/control the duct than it costs to enlarge the turbine radius by extending the blades. Submitted by Susan Miller on Fri, 05/08/2009 - 07:24. Mostly we should be putting them in western flat portion of the state and tying them into the grids nearby. Lima, Findlay, Bowling Green - I-75 corridor. IMHO. Submitted by Jeff Buster on Fri, 05/08/2009 - 08:27. Thanks Susan for linking back to those reports. There are scores of intelligent carbon reducing/quality job producing ideas around wind. These ideas are activily being avoided in Cleveland and all of Ohio. Just look around at what has happened over the last 5 years in Canada and the rest of the USA. Turbine Tower manufacturing facility at SteelYards is a 2004 report on Realneo. Several of us visited with Mr. Stuebi at the Cleveland Foundation to advocate this idea. No interest, No response. Even if the Rashidi concept was scientifically/aerodynamically sound (it is not) the ROI on Rashidi's nonesense is embarrassing. The presently funded Cleveland wind plans - about 3 miles out in Lake Erie and on water tanks - have to be the brainchild of the Coal Lobby. You think I am cynical, no, I am serious. While our windy farm land remains un/under exploited, fooling with wind installations in exotic locations is merely a tactic to delay non-fossil non-nuke energy production. However, there are billions of dollars of potential income from existing generation facilities riding on that delay.